Iodine deficiency, which can causes mental retardation, has come back to Vietnam, especially in mountain communities, the country's National Hospital of Endocrinology said on Saturday. According to the hospital's latest survey, some 60 percent of Vietnamese households use sufficient amounts of iodine, and the rate of children aged 8-10 having goiter are 9.8 percent. In the 2005-2006 period, 93 percent of families used sufficient amounts of iodine, mostly in the form of iodized salt, and few people suffered goiter. 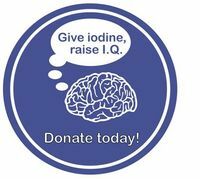 A key reason for the iodine deficiency comeback is that Vietnam's iodized salt mandate was repealed in 2006 and program administration budgets were slashed by 90 percent, said the Iodine Global Network, a non-profit organization for the sustainable elimination of iodine deficiency worldwide.